Marilyn had chronic daily headache and migraine for 40 years. Includes a recorded interview. Katy was only 12 years old when she began the programme for her migraine. Includes a recorded interview. Louise found the Resolution Programme worked like magic! Mark used the programme for his debilitating IBS and other symptoms – including hay-fever! Includes a recorded interview. Chronic pain and epilepsy- Reflex Sympathetic Dystrophy – Tracy had raging, off-the-scale pain that continued to escalate after an operation, and nothing the pain clinic could do could stop it. Includes a recorded interview. Tinnitus - Anne – also includes symptoms of panic, vertigo, headache, driving phobia, shoulder pain and plantar fasciitis (foot pain). Includes a recorded interview. Temporaral Lobe Epilepsy - Simon descibes these symptoms and how he used the programme to change his life.Includes a recorded interview. Myalgic Encephalomylitis M.E. Sue describes her symptoms. Includes a recorded interview. Dermatitis - Janet explains how she suffered year after year. Includes a recorded interview. Fibromyalgia - Maureen explains how this affected her life. Includes a recorded interview. Energy ‘Dips’ - Jacqui describes this strange symptom, these narcoleptic episodes. Includes a recorded interview. Backache - Julia describes how she used the programme for excruciating, paralysingly painful backache. Includes a recorded interview. Plantar fasciitis - A raging pain from her heel continued day and night for three months until Carol discovered Resolution magic. S.A.D. 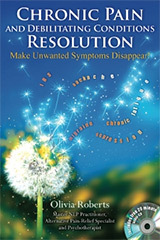 Seasonally Affective Disorder - Linda mentally ticked off nearly every subject on the symptoms list, and gradually worked through them all, until life became ‘normal’ again. Sciatica - Diana suffered days on end with unrelenting back pain. Some times all she could do to relieve it was to lie on the floor. Verruca - For ten years, Fiona had the worst verruca anyone had ever seen. Vertigo 1 – Robert suffered debilitating vertigo regularly, having to stay at home for many weeks every year. Vertigo 2 - Carole suffered from migraine in her teens, IBS in her twenties, and now, in her thirties, she had vertigo. Hay-fever 1 – Louise couldn’t take her children to the park, and she had to watch out of the window as they played in the garden. Hay-fever 2 – Tony couldn’t walk across the car park without becoming debilitated by hay-fever. Blushing - Samantha blushed so often, but why didn’t other people do too? Asthma - Anna nearly died three times from asthma the year before she began the programme. (Watch her interview on the home page video). Asthma - Stephen was a young boy who couldn’t do any outdoor activities in the summer. Anxiety & Tinnitus - Chris thought he was going out of his mind. Reynaud’s Disease - This is my story! Emetaphobia - Bryony had migraine and emetaphobia. Swollen Ankles - Helen used the programme for IBS, depression, and swollen ankles! Computer-block - it’s the new ‘writer’s block’!